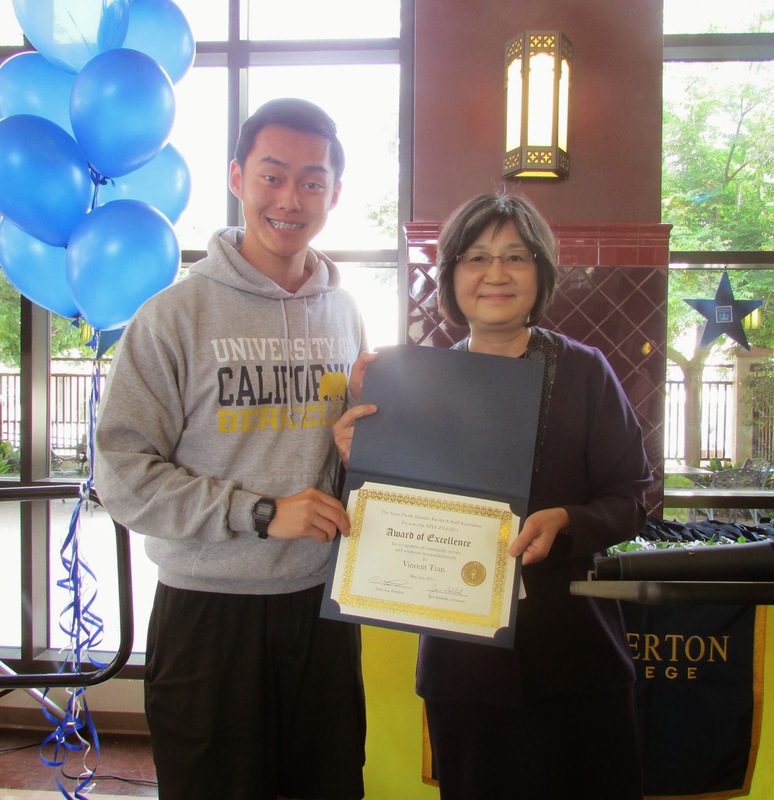 The 2015 APIA award was presented to Vincent Tran during the Cadena Transfer Ceremony. Vincent was up against other very worthy candidates who also had 4.0 GPAs and extracurricular activities. What made Vincent stand out was his extensive work in the broader community. Besides earning a Gold Medal Congressional Service Award for voluntary public service, personal development, and physical fitness, Vincent has already entered the political arena. Vincent was a volunteer coordinator on Bao Nguyen’s mayoral campaign and risked controversy by speaking in support of Nguyen before the Garden Grove City Council to start an open dialogue instead of red-baiting. He worked to promote cross-cultural understanding by encouraging Vietnamese community members to participate in Sikh events, advocating for legislation on behalf of the Sikh Coalition in Orange County, and helping to inform the public about hate crimes committed against Sikhs. Through Project MotiVATe, Vincent has successfully mentored at-risk Vietnamese American students to help them develop their academic and social skills so they can achieve their educational and personal goals. For the Bay Area Honors Research Symposium, Vincent presented his study on the limitations of the Western legal processes in combating human trafficking among Southeast Asian migrants. Vincent has been accepted to UC Berkeley, but has not made a final decision about his transfer university.